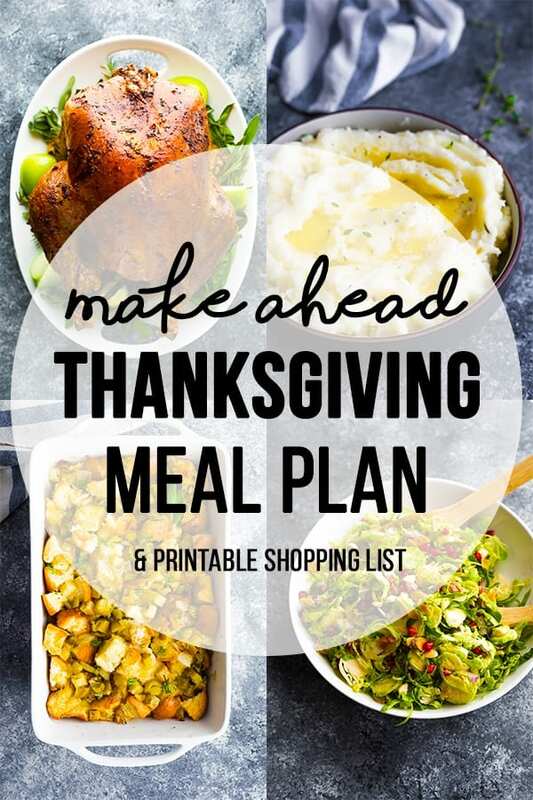 Sharing a make ahead Thanksgiving meal plan & printable shopping list. Make your holidays easy by doing some of the prep work ahead! All week I’ve been sharing my favorite easy Thanksgiving recipes, and now it’s time to put them together into a plan! I’ve got a printable Thanksgiving meal plan, shopping list and meal prep game plan so that you can have an easy breezy Thanksgiving (or Christmas) this year. Prepping a holiday meal does require some special equipment, so I thought it might be useful to link to some of my faves! My goal with this make ahead holiday meal plan was to give you flexibility with the timing of these recipes. Some you can make 1-2 days before, some you need to make the day before, and some you need to make the day of but can be kept warm for hours. Obviously the turkey is going to be cooked the day of. It is recommended to thaw the turkey in the fridge for several days. 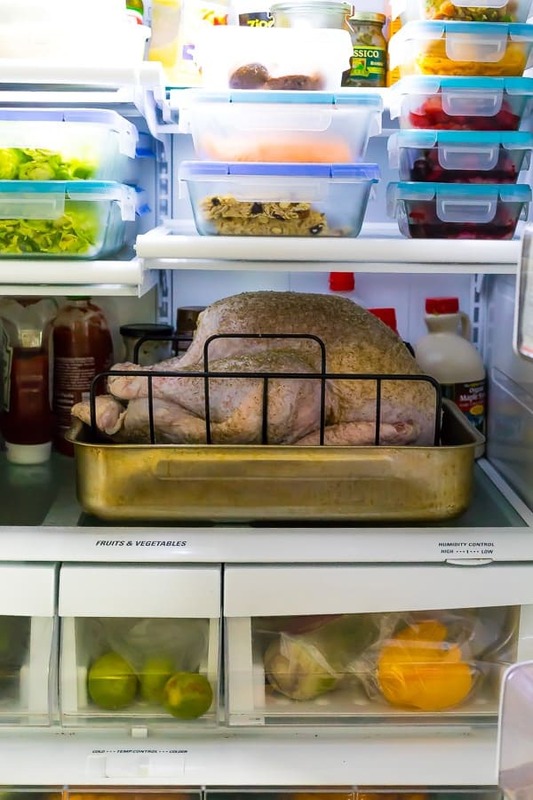 Make sure you start the thawing process early enough to defrost your turkey! This image is actually showing the brining turkey, you will thaw your turkey in the bag it comes in. 2-5 days before- start thawing your turkey. Refer to the label on your turkey for safe thawing instructions. It is recommended you thaw the turkey for several days in the fridge, the exact thaw time depends on the size of your turkey. Make sure you give yourself enough time to thaw! 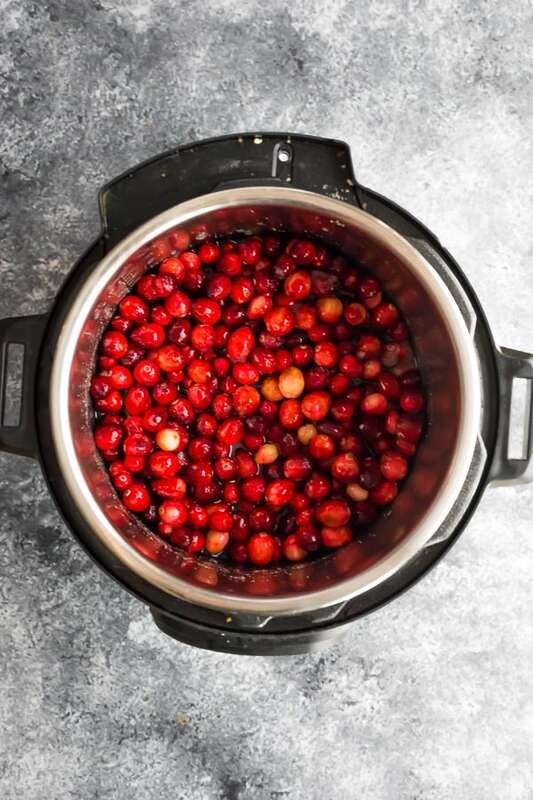 prepare your Instant Pot cranberry sauce. You can make your cranberry sauce on the stovetop or in a slow cooker as well! prep ingredients for the brussels sprouts salad: you can pre-shred your brussels sprouts, de-seed your pomegranate, and shake together the vinaigrette. prepare & bake the apple crisp: cool and store (covered) in the fridge. dry brine your turkey– rinse & dry turkey, remove giblets & neck, and rub with the brine mixture all over. Refrigerate overnight. 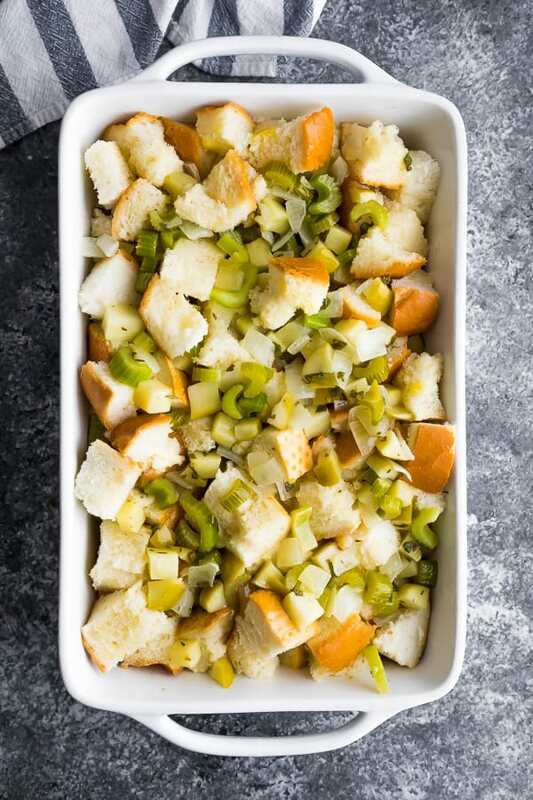 make your sage apple stuffing– this stuffing recipe is baked twice, which infuses it with so much extra flavor! Do all the heavy prep work the day before, bake, cool and refrigerate overnight. turkey- rinse off the brine, pat it dry, then rub turkey in garlic sage butter. Stuff the cavity with some aromatics, then roast in the oven for 2 1/2 – 3 hours. bake stuffing for the second time- all you need to do is pop it back in the oven (uncovered). You can squeeze it in with the turkey or wait until the turkey is resting. 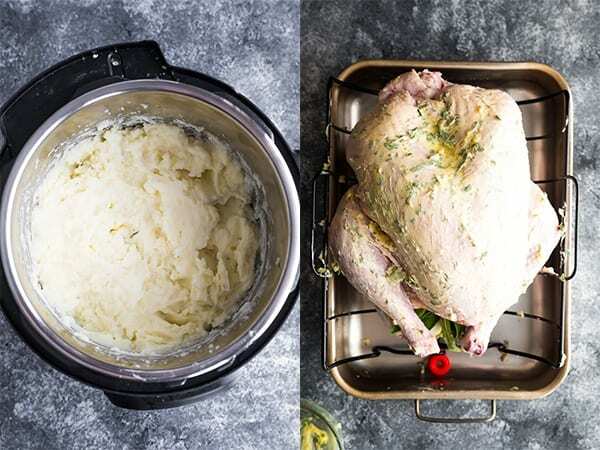 make Instant Pot mashed potatoes (up to 2 hours ahead); super hands off to prep. Keep them warm in the Instant Pot for a few hours. toss brussels sprouts salad in vinaigrette just before serving. re-warm apple crisp while dinner is being served. Do I have to make these Thanksgiving recipes ahead? Some of these recipes really benefit from being prepared ahead. 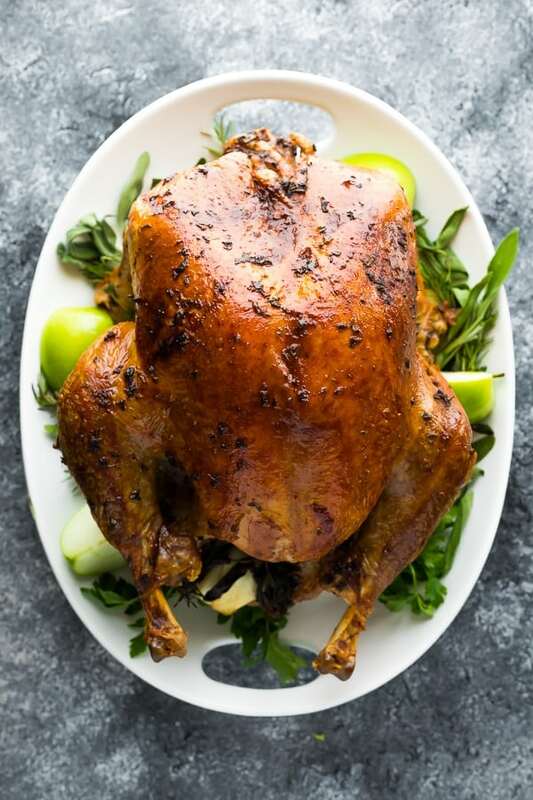 Taking the time to dry brine your turkey results in a juicy, flavorful bird. Double baking the stuffing infuses so much flavor into it. For these recipes, I do recommend making them ahead. For others, it’s simply a matter of convenience. 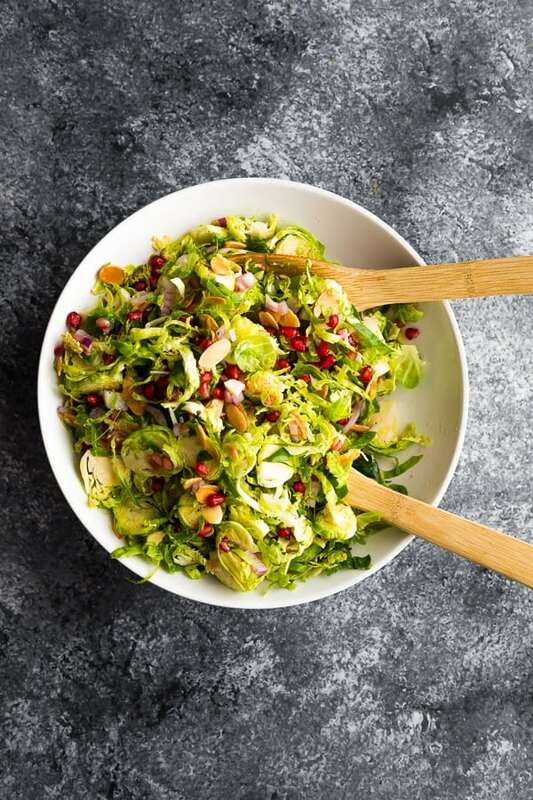 If you’d prefer to make the cranberry sauce, apple crisp and brussels sprouts salad the day you serve, that’s perfectly fine! 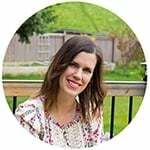 Do I need an Instant Pot for these recipes? No, you don’t. I love using it because it’s so hands off. If you’d prefer you can make your mashed potatoes and cranberry sauce on the stove top (though I don’t have cook times for you). What if I want to skip a recipe in this meal plan? No problem! Simply cross the ingredients with the corresponding number from the shopping list. How do I use up my Thanksgiving leftovers? Stay tuned! I have tutorials on how to make leftover turkey bone broth, leftover turkey stock, and leftover turkey detox soup coming up this week. I hope this make ahead Thanksgiving meal plan helps you out big time during the holidays! Don’t forget to download your FREE Printable Prep & Shopping List. Take care, and enjoy some great food.